The Lahontan Cutthroat Trout historically occurred in the Great Basin of Nevada including portions of southern Idaho and Oregon as well as eastern California. Two strains of Lahontan Cutthroat Trout evolved with one strain occurring in streams and rivers and the other strain evolving in the terminal lakes in Nevada, such as Pyramid Lake. The terminal lake strain of Lahontan Cutthroat Trout obtained very large sizes as they evolved predating on abundant populations of non-game fishes. For many of the same reasons that all interior subspecies of cutthroat trout have declined, populations of Lahontan Cutthroat Trout also declined to the point that they were listed as endangered under the Endangered Species Act in 1970 and reclassified as threatened in 1975. In search of remnant populations of Bonneville cutthroat trout in Utah, Don Duff with the Bureau of Land Management (BLM) discovered a population of cutthroat trout in Utah’s West Desert in 1975. 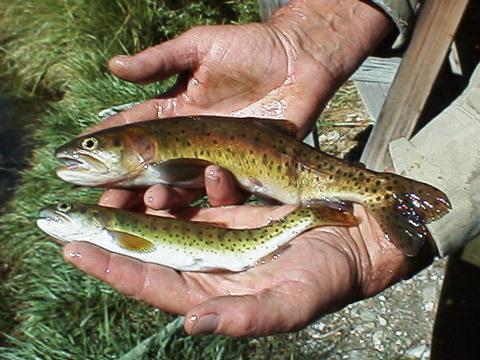 These cutthroat trout exhibited different coloration and spotting than ones native to Utah, so specimens were collected and sent to Mr. Cutthroat Trout himself, Dr. Robert Behnke at Colorado State University. Through the use of meristic and morphological traits (e.g., spotting, scale patterns, etc. 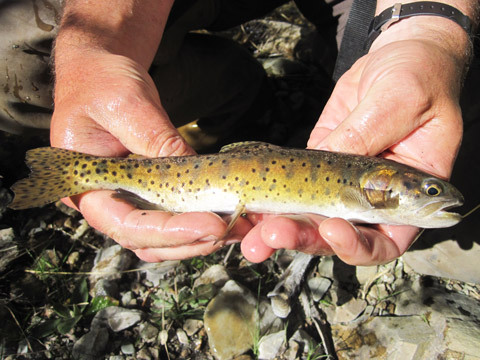 ), Dr. Behnke quickly classified the population of cutthroat trout found in Morrison Creek on the Pilot Mountains as Lahontan Cutthroat Trout. Since that time, this population very well may be the most genetically tested cutthroat trout population in history. As genetic markers and techniques are ever evolving, these fish have been tested through the years by Dr. Mary Peacock with the University of Nevada Reno, who is the Lahontan Cutthroat Trout Recovery Program’s geneticist. During every test, these fish have always been found to be the purest remaining terminal lake strain of Lahontan Cutthroat Trout. No one knows for sure how these fish ended up in Utah, but one legend contends that a Nevada Game Warden hiked up and over Pilot Peak from Nevada into Utah and stocked these fish. A more plausible scenario is that these fish were stocked into Morrison Creek in the early 1900s. Because Lahontan Cutthroat Trout grew to such large sizes, their eggs were shipped by rail car and stocked across the west. Lucin, a current ghost town, historically was a major stop on the transcontinental railroad and it is possible that Lahontan Cutthroat Trout were off loaded there and transported the 22 miles southwest to Morrison Creek. 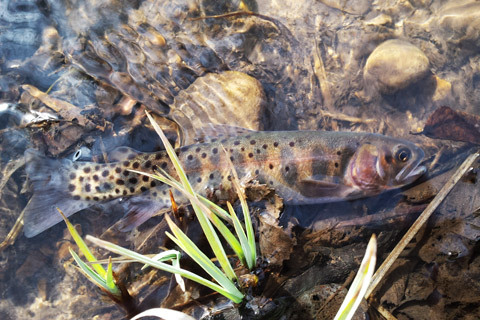 Regardless on how these fish found their way to Utah, the Utah Division of Wildlife Resources (UDWR) and Trout Unlimited realized their importance. In 1986, the UDWR chemically treated Bettridge Creek, the drainage directly north of Morrision Creek, to remove rainbow trout and Lahontan Cutthroat Trout from Morrision Creek were utilized as a source to plant this stream. Having these fish in two drainages increased their redundancy and resiliency to potential catastrophic events, such as wildfire. Also in the late 1980s and early 1990s, Bryce Nielsen, a biologist with the UDWR, worked with a private landowner on Pilot Mountain and three small hatchery ponds were built. Lahontan cutthroat trout from both Morrison and Bettridge creeks were moved into these ponds where fish quickly grew from 10 inches in the streams to 10 pounds in the ponds. The United States Fish and Wildlife Service (USFWS) spawned Lahontan Cutthroat Trout at these ponds for about 15 years until their broodstock at the Lahontan National Fish Hatchery was fully developed. 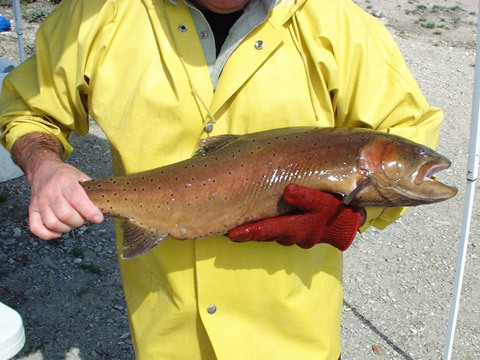 Recently, the Pilot Peak strain of Lahontan Cutthroat Trout have replaced older terminal lake strains and are the fish being stocked into Pyramid Lake. The Pilot Peak strain grew larger than the older terminal lake strains and fish well over 20 pounds are being angled in Pyramid Lake. There is even talk that the historical record of 41 pounds may fall in the future! 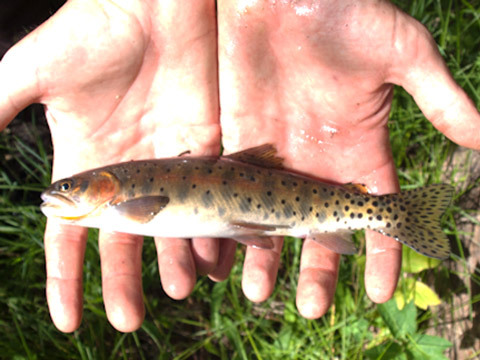 While the USFWS no longer collects Lahontan Cutthroat Trout eggs from Utah, Morrison Creek and Bettridge Creek are still being managed for this species. In 2006, a wildfire burned across the entire Morrision Creek watershed and this population was lost. Between 2013-2014, cutthroat trout from Bettridge Creek have been collected and utilized to replant Morrison Creek in order to maintain populations in both streams. Because Lahontan Cutthroat Trout are not native to Utah, they were not a subspecies included as part of the Utah Cutthroat Slam. If you wish to catch a Lahontan Cutthroat Trout in Utah, Bettridge Creek is your best bet as it is the larger of the two drainages and occurs primarily on BLM land, but be prepared for fishing a small, brushy stream. 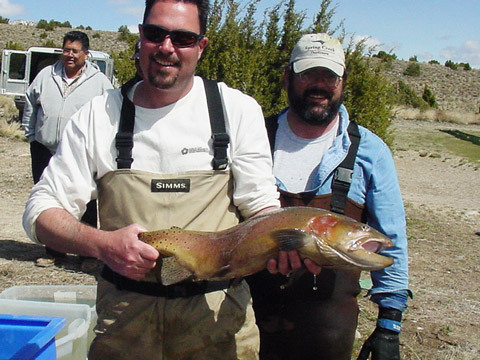 If you have more questions on angling Lahontan Cutthroat Trout in Utah, please call the UDWR Northern Region Office (801-476-2740) and ask for a fisheries biologist. 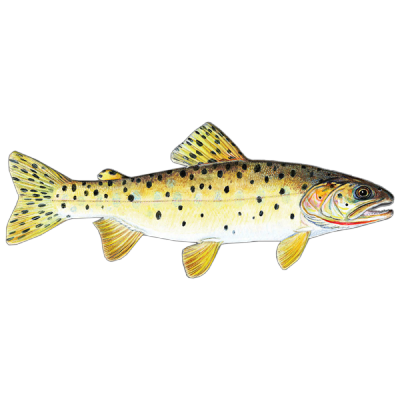 Greenback cutthroat trout are the easternmost subspecies of cutthroat trout. They were once widespread in the South Platte River drainage east of the continental divide in Colorado. 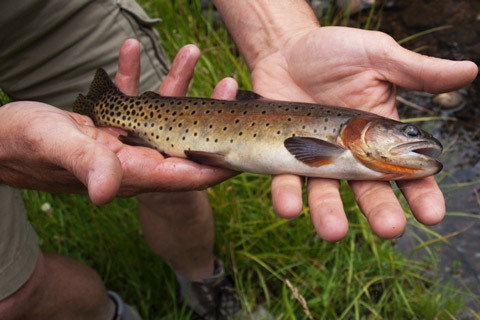 The world of cutthroat trout genetic testing, including available cutthroat trout markers, is ever changing and in the mid 2000s, cutthroat trout in some of the drainages on the west side of the continental divide in Colorado were thought to be Greenback cutthroat trout. During this time period, cutthroat trout were discovered in one small stream on the eastern slope of the La Sal Mountains near Moab and these fish were thought to be Greenback cutthroat trout. During the past 10 years, however, geneticists have determined that these suspect Greenback cutthroat trout on the west side of the continental divide are indeed Colorado River cutthroat trout, however they evolved through a different lineage (the Green lineage) than other Colorado River cutthroat trout. All other Colorado River cutthroat trout in Utah evolved through what has been determined to be the Blue lineage. While these lineages will be managed independently in Utah, all of the cutthroat trout native to the Green and Colorado river drainages will be considered Colorado River cutthroat trout for the purposes of the Utah Cutthroat Trout Slam.